Scientific Name: Order Heteroptera, Family Lygaeidae, spp. Size: Adult - 1/8" - 1/4"
Identification: Adults are light yellowish-green to dark gray with small black dots on the head. Wider body than chinch bugs and have more rapid movements. Eyes are very large, kidney-shaped and reddish brown. Football-shaped eggs are whitish gray with red spots. Nymphs are smaller grayish and wingless with irregular patterns of spots on the top of the body. Biology/Life Cycle: Incomplete life cycle - eggs, nymphs, adults. Several broods per year in the summer. Adults hibernate in garden debris over the winter. Adults live two to three months after maturity. Habitat: Cotton, clover, winter grains, weeds and alfalfa. Feeding Habits: Often appear when chinch bug populations are high and feed on them. 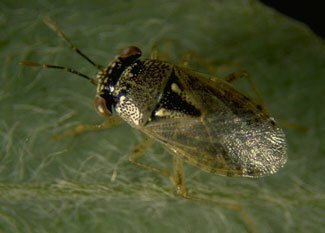 Both adults and nymphs feed on aphids, lygus bugs, whiteflies, leaf hoppers, plant bugs, small caterpillars, thrips, corn earworm, tarnished plant bugs and spider mites. All stages of both sexes are predatious from birth until death but they can survive on nectar and honeydew when prey is scarce. Insight: The probosis (modified mouth structure) of the big-eyed bug extends like a hydraulic piston's ram in stages. This is one of the insects that will naturally reestablish if the toxic sprays are eliminated.